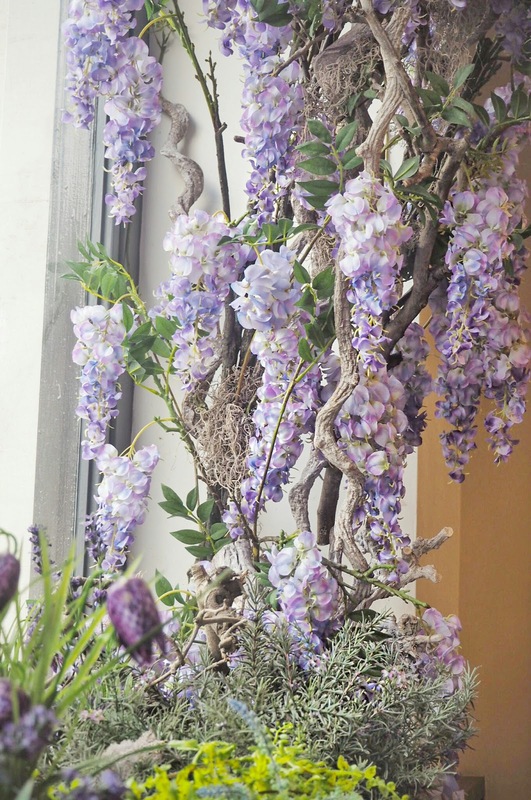 All the hanging blooms of Spring Wisteria may be a distant memory with the fall of the Autumn leaves in bright oranges and browns. 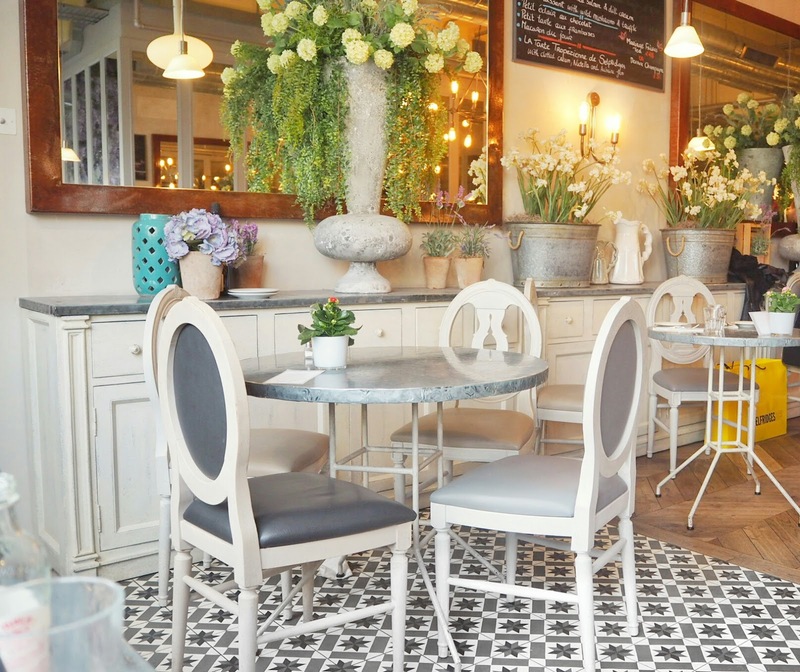 Though, Aubaine located in Selfridges is full of the brightness and pretty flowers of Spring, with the French bistro a haven for those seeking out brunch or afternoon tea. 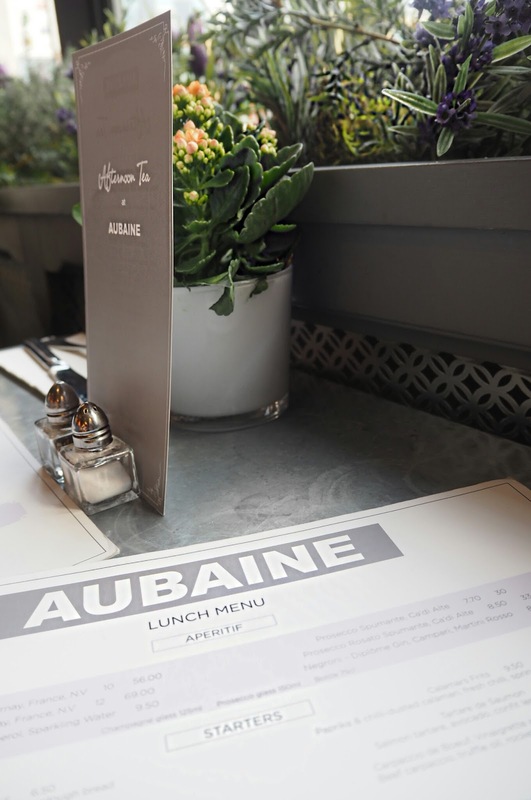 Located on level two of the busy department store Selfridges, Aubaine offers quiet tranquillity away from the hordes of shoppers descending to the store to start their Christmas shopping. 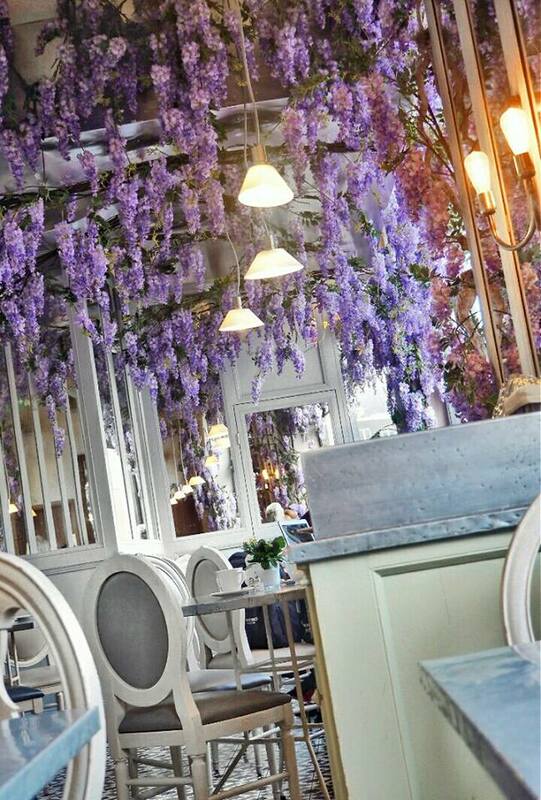 If you are not in the know it may be easy to miss their cosy, charming little dining area adorned with lilac Wisteria. Arriving just after 11.30am, Adam and I were easily seated and viewed the menu, which had everything from exotic lunch dishes, to sandwiches as well as French favourites such as Moules Marinière. 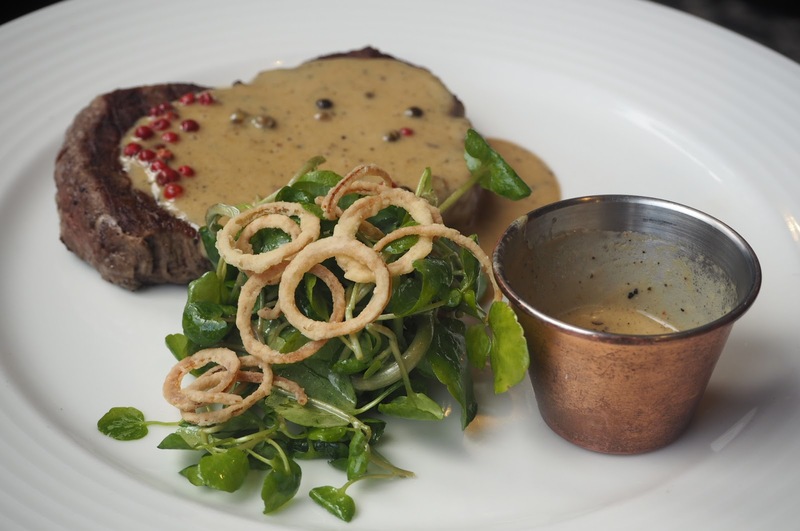 Adam opted for the Filet De Boeuf, his staple of steak with peppercorn sauce, which was served with fries and crispy shallots. Having had my heart set on the Moules Marinière and with some hesitation deciding that ordering the lobster spaghetti was a bit too excessive at £28 for an early lunch, I opted for Le Croq’ Aubaine; otherwise known as a ham and cheese sandwich. But no, not any ham and cheese sandwich, gruyère and béchamelcheeses melted on the top of the sourdough bread, containing bayonne ham. 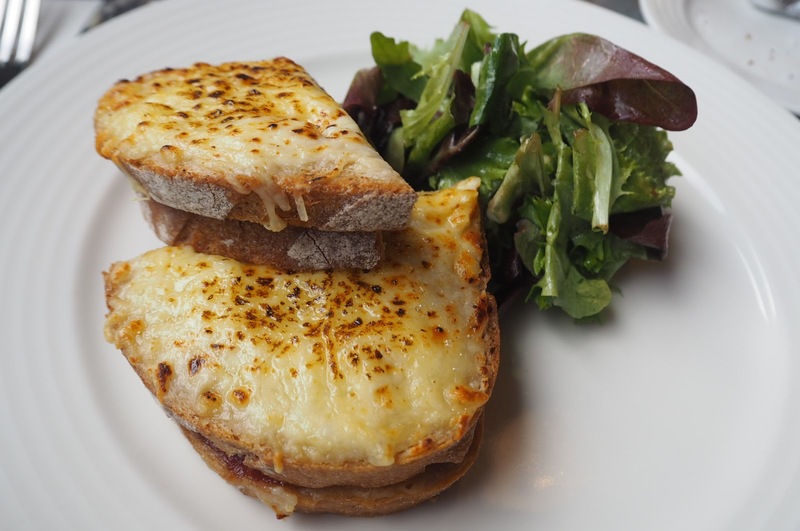 Who am I to say no to oozing gruyère – C’est formidable! The sandwich was beautifully presented and very tasty, though in hindsight I wished I’d splashed out and ordered the lobster spaghetti. 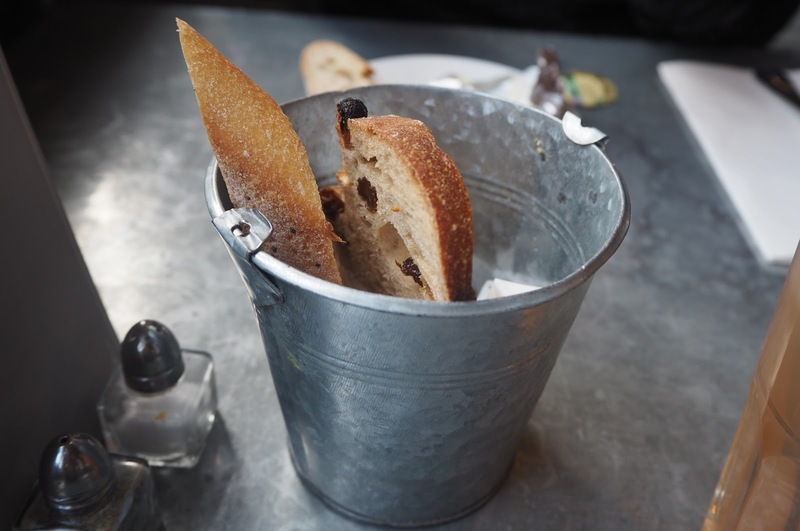 That said, as the Croq’ Aubaine demonstrated, it is simple dishes such as this that the French effortlessly make exquisite. 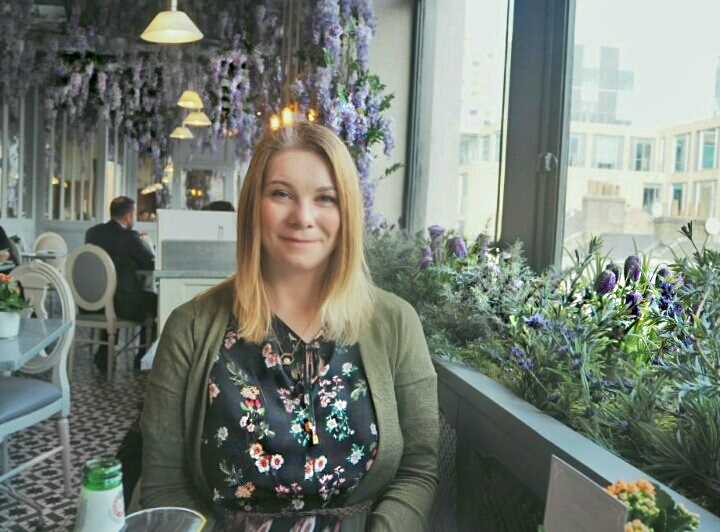 Our welcoming lunch at Aubaine was ideal to escape the chilly air and hustle and bustle of Oxford Street, with our table located next to the window being the ideal spot to basque in the Winter sunshine as we dined. After clearing our dishes and enjoying our respective tea and coffee, we were tempted by the inviting tray of cakes the waiter offered the table next to us. 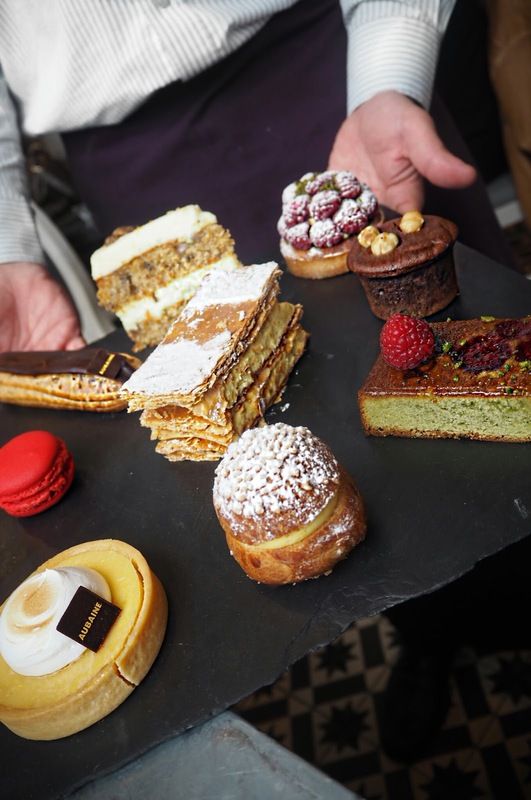 The selection of patisseries were enough to tempt any lover of sweet toothed treats. 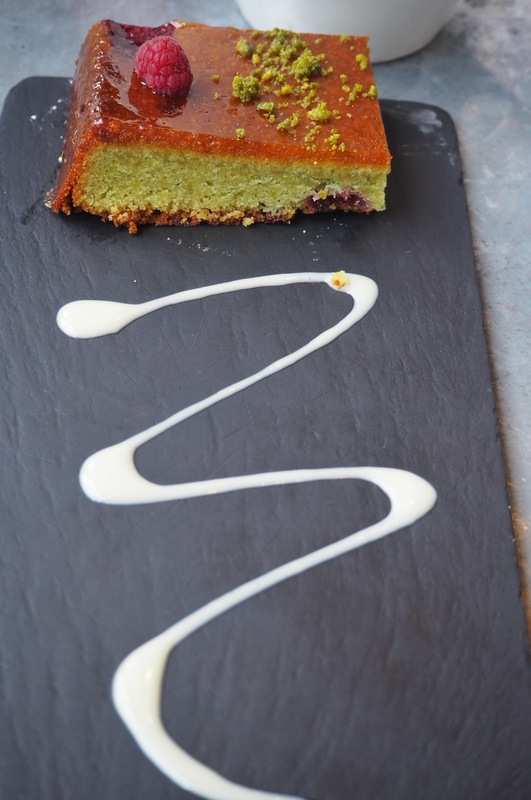 Wide-eyed and ready to tuck in, I ordered the pistachio and raspberry sponge. 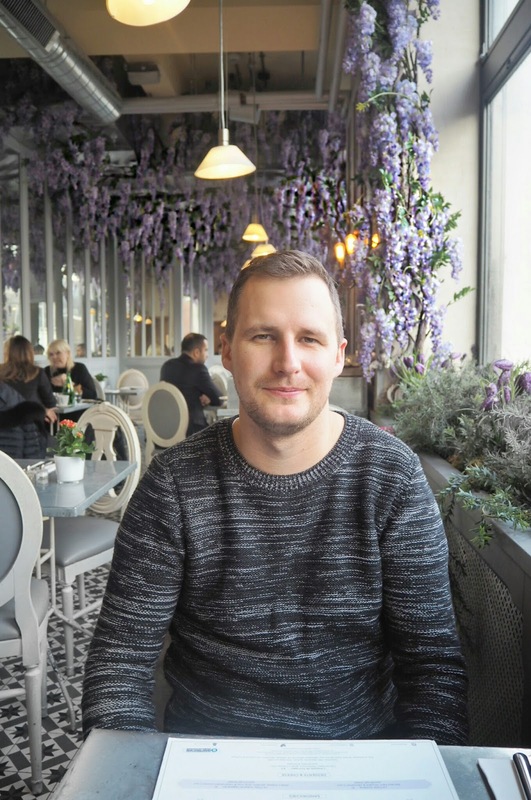 Adam not content on just eating a steak, ordered a huge slab of carrot cake. Honestly, it was huge and I wasn’t quite sure how he managed it after his steak but manage it he did! 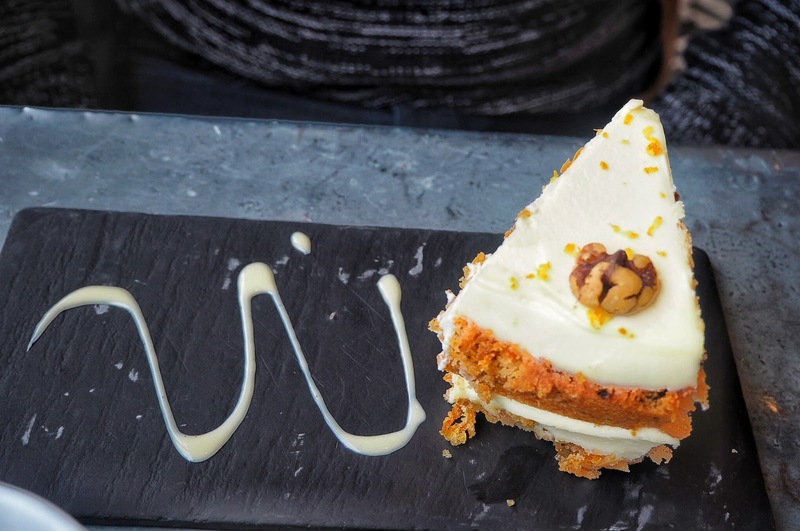 The carrot cake was rich, full of flavour and topped with crushed hazelnuts. 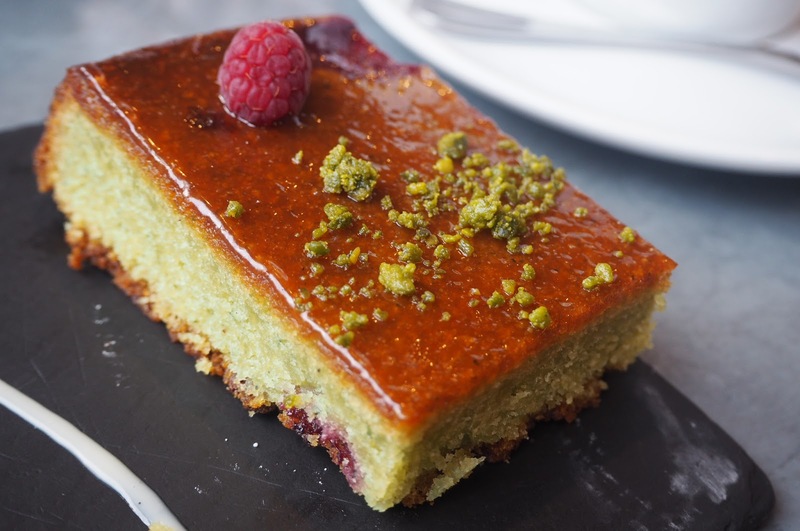 The savoury flavour of the pistachio was complimented by the sweetness of the raspberry, with the cake being light and not too filling as a dessert. 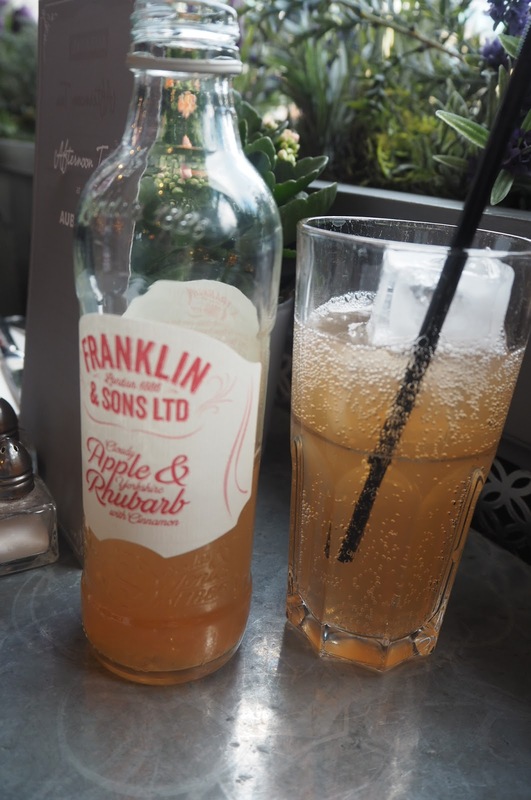 By the time we had almost devoured our sweet delicacies the bistro was almost full with the masses of shoppers who had somehow discovered our pretty bijou, which signalled our time to leave. 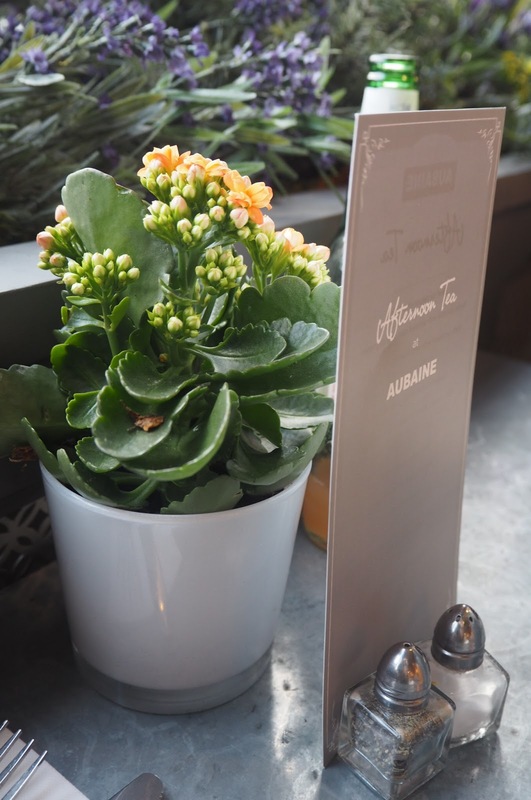 The elegant décor of the bistro and delectable French cuisine on offer sets Aubaine apart from other cafe bistros I’ve visited and is well worth a trip whether you are shopping in Selfridges or not. 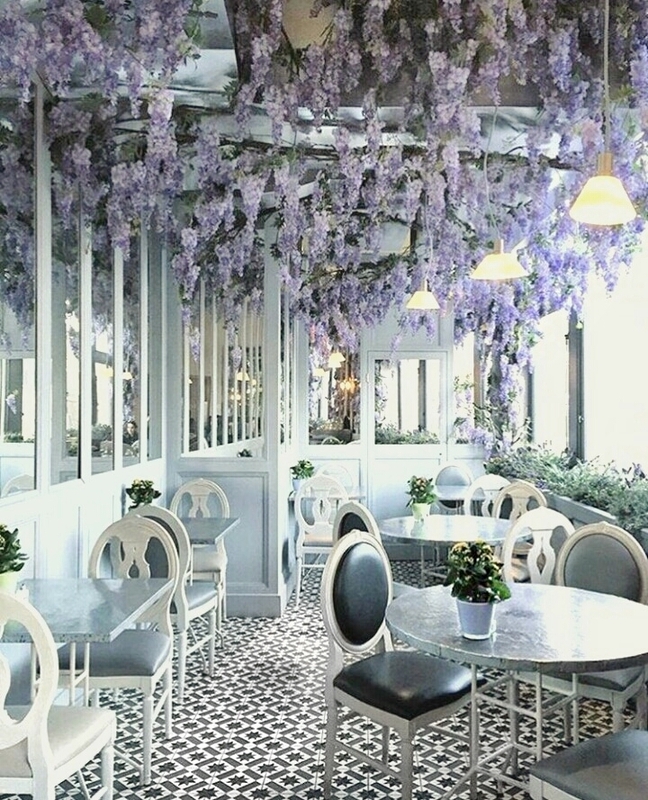 It goes without saying, such a picturesque, instagrammable lunch spot such as Aubaine does not stay a secret for long, particularly one located next to a shoe boudoir! 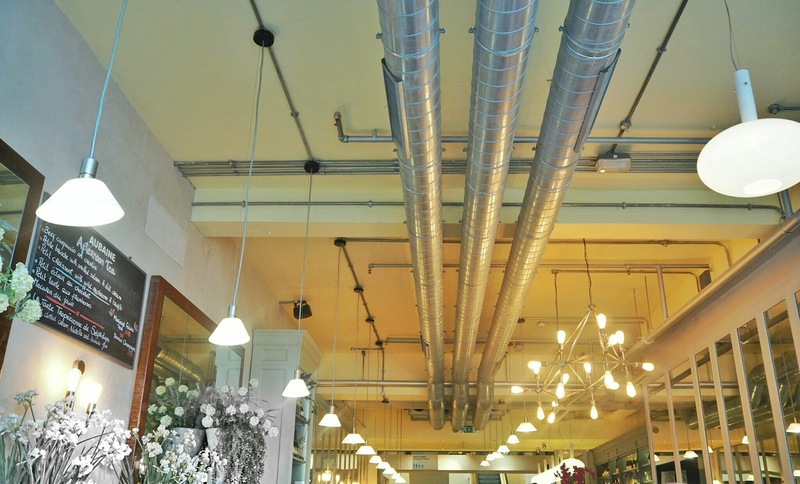 To make a reservation call : 0203 740 5861 or make a booking online by clicking here.